Happy Sunday everyone!!!! I hope you all are having a great day! Even though Sunday means that tomorrow is Monday, Sunday means that it’s my day to pamper myself. I get to paint my toes, put on a face mask, relax a little and use my all time favorite beauty products! Can you guess what it is? Coconut oil!!! Yes that’s right, coconut oil. I make sure and get 100% extra virgin coconut oil. You can find it just about anywhere. It is the best thing and for so many reasons. Here is a couple of different ways that you can use it. It can be used to help with hair growth. Every Sunday morning I wake up and put coconut oil throughout all of my hair. I leave it in throughout most of the day and then wash it out when I shower. I make sure to shampoo twice and condition once, just to make sure and get it all out. Not only does it help with hair growth, but it leaves your hair smooth, shiny and smell amazing! It is the best makeup remover. It even takes off waterproof mascara like nothing. I use it to moisturize my entire body! After I wash my face I make sure to put it before I put on any makeup or even when I am going bare face. It gives an amazing glow to the skin. I cook just about everything with it! 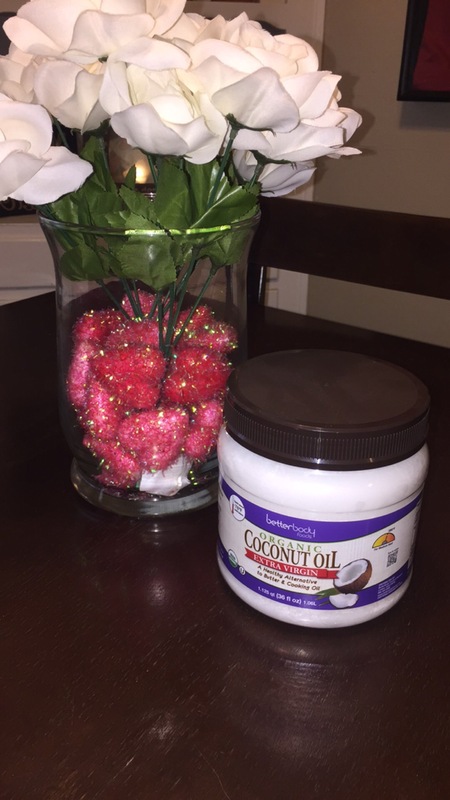 It is so much healthier to use coconut oil than any other oil. And lastly, I put some in my water everyday. It helps break down a lot of the bad stuff in your body and helps with weight loss. These are just a few of the amazing things that coconut oil helps with. I challenge you to try it out. You will get addicted. Thanks for reading! Don’t forget to like and follow my blog! I follow back. You can also follow me on my social media.